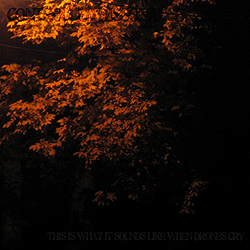 Suggestively minimal dark ambient compositions are the modus operandi of This Is What It Sounds Like When Drones Cry. This new release from Controlled Dissonance explores the indistinct field of drones. Coming off as a stripped-down version of the Controlled Dissonance of lore, …When Drones Cry delivers a solid set of deeply mesmerizing and soporific tracks that meld classic drone with the soft noise ambient style of Controlled Dissonance.